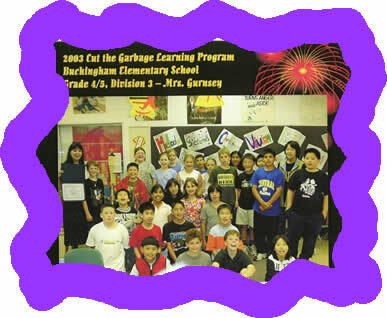 I have been the environmental contact for Buckingham School for over 18 years. In that time, we have completed over 1000 environmental projects, have won the Minister of the Environment’s Youth Award, which we flew to our capital city Victoria to accept, and have won the City of Burnaby’s Youth Award for our environmental work in the city. Both awards highlight groups that have gone the extra distance to enhance, preserve or protect the environment. My own personal inspiration was Clinton. My school, Buckingham Elementary, is quite small, with about 230 children from kindergarten to grade 7. It is tucked away in a lovely neighborhood with trees everywhere and gorgeous views of the local mountains. There is a strong sense of community here and the parents are very supportive. The children have been excited and ready to jump on board with new ideas and have loved our involvement in environmental activities. When I first came to this school, everything was thrown away. There wasn’t any kind of environmental work going on at all. I started taking paper from each classroom from the garbage cans and lugging it to the recycling depot in the back of my car. We made use of Waste Audit programs to plan strategies for our garbage to be reduced and have succeeded in going from two huge industrial containers a week to one very small container a week. My class is the official “Garden Club” and I have taught each class to plant, tend and prune. The children have learned about root structure, proper watering, weeding and spacing. Kids actually take books out in the warmer weather and lie down in the grass by the garden to read. 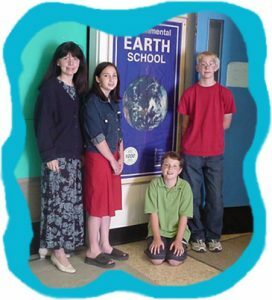 Fifteen years ago, the school was signed up for the “SEEDS” program — an environmental program funded by industry and educational groups in Canada. They run this program like the Olympics, having project goals in the bronze, silver and gold categories and then urging you to continue into the green, jade, emerald and Earth school groups. We have gone through each level and two years ago completed the final goal. The huge Earth School banner is now framed and hangs in the school foyer. 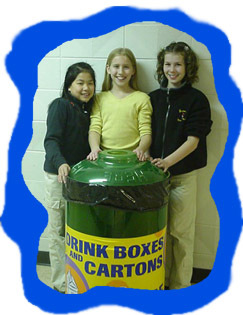 We have regular used battery recycling, printer cartridge recycling, poll the parent body about home recycling status and keep in touch with the school district’s environmental programs. The custodian is vigilant about keeping the heat turned down and outside doors closed in the cold weather. Light bulbs are changed regularly to keep lighting efficient and energy efficient bulbs are used. We are all encouraged to turn out the lights when we leave a classroom empty for more than half an hour. Our Salmonid program has been a regular feature for one primary class and my own class buddies with that class to go to outdoor school every year. One of the last projects for the Earth Level was outstanding and took a lot of thought. We had to put together a shoebox full of items to show another part of Canada what our environment was like here in Burnaby. The items ended up being things like crow feathers, beach pebbles and sea shells, articles from the local newspaper, pictures of the natural environment around the school, pressed leaves and fresh fronds of cedar, etc. Our kids bring letters to school, articles from newspapers, problems they see in the environment around us. They have become inquirers. The whole climate of the school has changed and rather than specific projects, there is just a higher sense of doing the right thing.